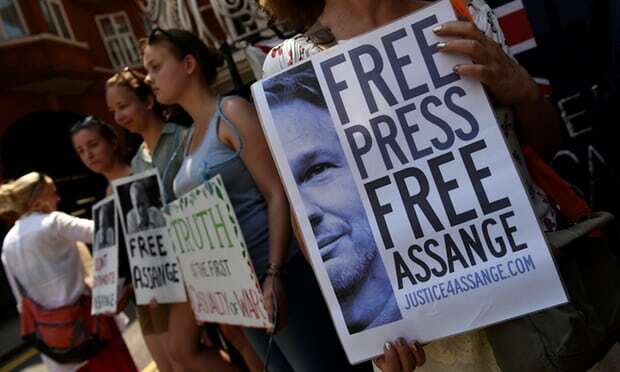 The US has been considering prosecution of Assange since 2010 when WikiLeaks published hundreds of thousands of confidential US defence and diplomatic documents. US attorney general Jeff Sessions said in April this year that the arrest of Assange is a priority for the US. The director of the CIA, Mike Pompeo, after leaks of emails from the US Democratic party and from Hillary Clinton, described WikiLeaks as “a non-state hostile intelligence service often abetted by state actors like Russia”. He added Assange is not covered by the US constitution, which protects journalists. The comment is made under a heading that says simply: “Facts”. The 2016 presidential candidates have had mixed views about Wikileaks. While his administration has threatened legal action against Julian Assange, Donald Trump stated that he loved Wikileaks when they were releasing information about Hillary Clinton. Hillary Clinton, never a fan of government transparency or accountability, has taken a hard line against Wikileaks and engaged in a typical Clinton smear campaign of misinformation against them.